For those of us who don’t feel like going to the gym for an hour-long session, we need something quick and effective – a plan that targets and tones without wasting any time. This 15-minute upper-body workout calls for medium to light weights and lots of reps. It goes by fast, so you’ll quickly transition from one move to the next. Before you know it, 15 minutes will be up and you can get back to your day feeling fitter than you were before! Lie down on a bench, table, floor or stability ball. Hold weights in each of your hands. Start with your arms at a 90-degree angle, bending from the elbows. Press your arms straight up toward the ceiling. Bring them back to 90 degrees. That’s one rep. 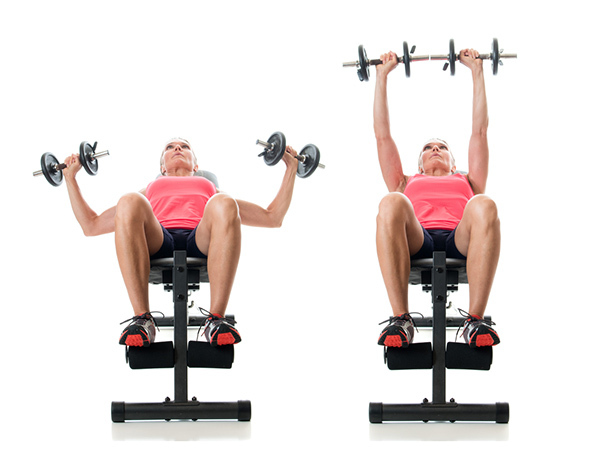 Aim for 2 sets of 10 reps.
Start from a standing position with weights in each hand by your sides. Bend your elbows to bring both weights up toward your shoulders at the same time. Straighten your arms to bring the weights back down to your sides. Repeat for 20 reps.
From a hip distance standing position, hinge at the waist and keep a flat back. Keep your arms straight as you hold your weights in each hand. There are two moves here. The first is to bend your elbows and bring the weights up to your sides in a rowing motion. The second move is to straighten your arms behind you, keeping your elbows straight as you push the weights behind your body. Go for 20 reps. Stand on one leg, on the same side that you hold a dumbbell. Keeping that knee slightly bent, perform a stiff-legged deadlift by bending at the hip, extending your alternate, free leg behind you for balance. Lower the dumbbell until you are parallel to the ground, and then return to the upright position. Aim for 2 to 3 sets of 15 reps on each side. We all know how to do a pushup. 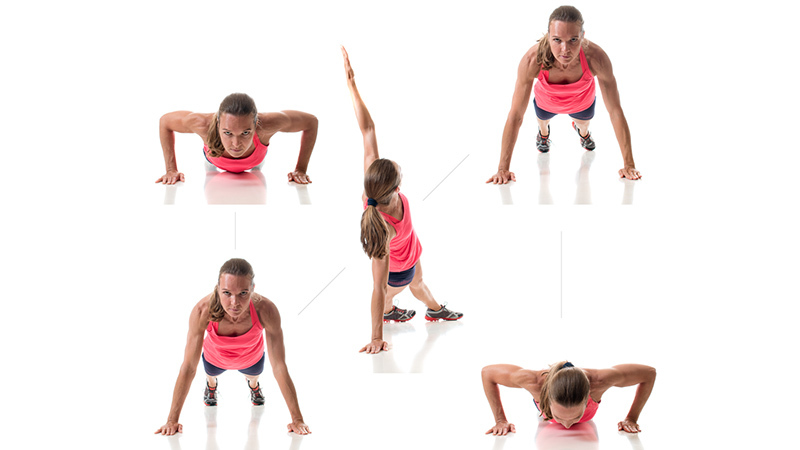 The question is: Which pushup is right for you? If you’re just beginning an exercise program and don’t have a lot of arm strength yet, it may be best to start on your knees in a modified pushup. If you’re more advanced, you can do a military or standard pushup. If even that feels too easy, try raising one leg every time you push your elbows toward the floor. And, if you really want to target your triceps, bring your hands closer together in the shape of a V (pictured). Aim for 20 reps. The movement here is the same as in a bicep curl, but the difference is how you hold your weights. Instead of holding your arms straight out in front of you, rotate your wrists so your thumbs are facing the ceiling and your palms are facing your body. Try to do several sets of 20 reps.
Holding a dumbbell in each hand, begin standing straight with the palms of your hands facing your thighs. While maintaining the torso still (no swinging), lift the left dumbbell up straight high, until your arm is parallel to the floor. Lower the dumbbell back down slowly to the starting position, and repeat the motion with the right dumbbell. Aim for 2 to 3 sets of 15 reps for each hand. Been in a a push-up position. Perform a standard push-up with legs straight or on knees. Rotate to the left so feet and hips are stacked. Raise left arm for a breath. Lower arm; return to starting position. Repeat on other side. Aim for 2 to 3 sets of 10 reps for each side. You can start from either a standing or sitting position with a dumbbell in each hand. Hold the weights straight above your head. Bend your elbows to bring the weights behind you. Straighten to bring them back to the starting position. Try for 2 to 3 sets of 15 to 20 reps. Begin with a weight in each hand. Start with your arms straight by the floor and then raise your arms in a straight line out by your sides so they form a long line with your shoulders. I think that there should be a teen version of the workouts.